I had an incredible opportunity to present a barrier breaking seminar in St. Petersburg, Florida on Thursday. On the flight down I worked on the script and prepped myself for an exciting adventure. I wrote about it on my personal blog if you want to check it out. Read the post here. On the flight home I sat on the plane and opened my computer to watch this top five (in my opinion) movie. If you haven’t seen the movie there are many resilient characters represented. Personalities who don’t give up, no matter what. My favorite is Inigo Montoya, a Spaniard who watched his father die at the hands of horrible six- fingered man. He’s devoted his life to finding this man and killing him in revenge. He’s been searching his entire life and at one point explains to another what will happen when he meets this man, “I will say, My name is Inigo Montoya, you killed my father, prepare to die”. When he finally has his moment, the six-fingered man throws a low blow and stabs him as he comes around the corner. He’s incapacitated and it looks like he will die. Then he begins to repeat his mantra. Again and again. He becomes stronger with every repetition and he rallies. While the passion of revenge isn’t in alignment with my own mission I do recognize an insatiable desire for something, visualizing it, believing you will see it through, and creating an almost certain experience of it. I’ve been passionate about sharing my message of confidence, self-love, and breaking through for awhile now. Recently I’ve become more specific in my desires to speak often and now many opportunities are arriving. 1. 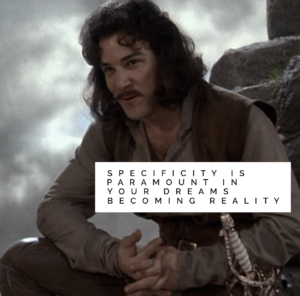 Specificity is paramount in your dreams becoming reality. It really, doesn’t get more specific than ‘my life goal is to find the man who killed my father, say this exact phrase to him, and kill him’. I might have ruined it for you, but Inigo does get what he was specifically wanting. So the question I invite you to ask yourself is, ‘Where can I be more specific about my desires, goals, and dreams’? Write it down. Create a scenario you can connect with emotionally and one you feel is as detailed as possible. Even down to the thing you’ll say when it arrives. The second thing I experienced was a Memorial day health kick off with my friend Kalsey. We have set up a 21 day plan around complete wellness. It began with a Memorial day run in downtown St. Paul. Now, I’m not a fan of running and I’m also definitely not in any kind of shape I’ve been in before. It was a very stagnant winter for me and my fitness/cardio level is sub par for me. Almost immediately after we began running I was hating it. My legs were burning. I wanted to stop. I was wondering how much longer it would be and please, for the love of all, when will this be over? 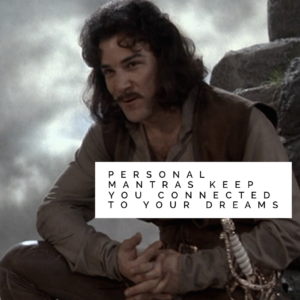 Then Inigo Montoya came to my mind. In this moment, my body on fire, wanting to quit and walk, I remembered his resolve after being stabbed and coming back from it. I began to repeat it with each step to the ground and I kept going. The burning continued but I didn’t stop saying it. I started to feel a bit stronger with each repetition of the mantra. It steeled in me determination to make it through the 3 mile run. As Kalsey bopped in front of me running, then stopping to do squats, grab water, and sprint off for sections I stayed the path holding my pace, repeating my mantra over and over. The last 1/2 mile was an uphill climb to the top of a bridge. I never stopped repeating it. I made it. It was hard for sure. I wanted to stop the entire time. This mantra connected me to my desire. I know who I am. I know what I want. I will achieve it. 2. Personal mantras keep you connected to your dreams. When things get challenging, and they always will, a mantra will remind you of your highest self so you don’t succumb to the smaller self who says you need to stop and it’s too difficult to keep going. It might not make the challenge any less. It will make the challenge achievable. What’s your mantra? Where do you need encouragement from your highest self to steel forward and continue the journey. Create it and use it liberally.